It’s a bit of a mixed bag today. Nothing makes it into a BBI 5 star deal but there’s still some good buying to be had. THE WINE FRONT: If you don’t subscribe to their blog, you’re missing out on some of the best and up-to-date discussion on wines covering not only Australia, but a great selection of Europeans as well. Almost daily updates on tastings from Gary Walsh, Campbell Mattinson, Mike Bennie and a host of other commentators. Great stuff. Go to their website at http://www.winefront.com.au and start enjoying now. I have no association with WineFront other than I’m an enthusiastic subscriber! 2010 / Luke Lambert / Yarra Valley / Nebbiolo / A$55 / 95 points – It’s only just been released but I’ve got some (just got it today!). If you’re interested, email me and I’ll work out a price for you landed and cleared here. 2012 / Luke Lambert / Yarra Valley / Crudo Rose / A$28 / 95 points – Ditto, as per the Nebbiolo. 2012 / Mayer / Granite / Yarra Valley / Pinot Noir / A$55 / 94 points – Yep, got a tiny amount of this too. Email me for pricing and timing. 2012 / Holyman / Tasmania / Chardonnay / A$45 / 94 points – I don’t have it but I’m a bee’s whisker away from it. If you’re interested, you know what to do. 2012 / Holyman / Tasmania / Pinot Noir / A$50 / 96 points – If you want some, I I may have to dip into my personal purchase! 2012 / Chatto Wines / Isles Vineyard / Pinot Noir / A$45 / 95 points – I have it on personal account, yell out if you’d like me to get some for you. 2012 / 3 Drops / Mount Barker / Pinot Noir / $28 / 94 points – Coming up in January and S$39. A bargain. 2001 / Arras / EJ Carr Late Disgorged / Sparkling / A$130 / 96 points – A very, very limited number for S$188. 2011 / Bellwether / Tasmania / Chardonnay / A$50 / 96 points – I’m chasing some as we speak. If you want to join me…you know what to do. 2012 / Freycinet Vineyards / Tasmania / Riesling / A$25 / 96 points – It’s waiting to come up and it’s S$44 (inc gst). Not a lot of it, so don’t muck around. 2011 / Goaty Hill / Tasmania / Pinot Noir / A$34 / 90 points – Here now at S$55. 2002 / Radenti / Tasmania / Sparkling / A$55 / 97 points – A special release by Claudio Radenti of Freycinet Vineyards. Not available wholesale and only available via Freycinet’s website. If you want some up here, yell out (quickly), as I’m getting some. 2010 / Spring Vale / Tasmania / Pinot Noir / A$40 / 95 points – Will definitely be getting some, in the meantime I have just 4 bottles left of the 2009 (Halliday 92) at S$52. NV / Stefano Lubiana / Brut Reserve / Sparkling / A$34 / 92 points – here now and S$43. Perfect for Christmas but be quick. We finish deliveries on the 8th. 2012 / Waterton / Tasmania / Riesling / A$29 / 93 points – I’ve got the 2009 (Halliday 96) in Singapore and it’s $58. Ah, how times have changed. The young’uns amongst us probably wouldn’t appreciate that when the fax machine first came out, most places locked it up at night behind a clear cover. Life before the urgency of an email, text or Twitter. 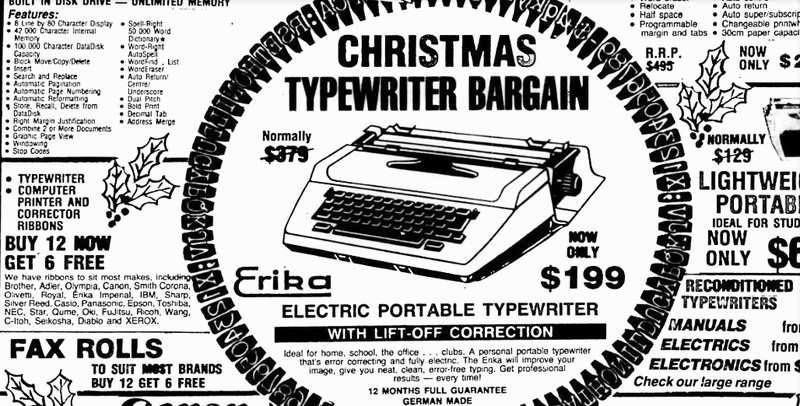 And $199 was a fair bit in 1989. Earlier this year, I bought some 2002 Ashton Hills Sparkling Shiraz for my cellar in Australia. I’m a big fan of aged sparkling shiraz and we’re still drinking 1985 Seppelt Show Reserve. Sure, the odd bottle is a little flat but the blackberries, oh, the blackberries. I tracked down some Ashton Hills reds and whites in Singapore but they were a bit exxy, so I used the opportunity to ask the retailer when I might drink the 2002 sparkling shiraz. The answer I got was that all sparkling wine should be drunk early and that I shouldn’t hang on to the wine for much longer. Hmm, this just didn’t gell with the fact that the current release is 2002 so I decided to follow up with Ashton Hills direct. No website, so that meant a phone call. Of course, one of the benefits of picking up the phone is that you actually get to speak with a real person, and in this case it was the winemaker himself, Stephen George. His candid response to the advice I had received was “BS” and that the wine would cellar for at least another 10 years. Denise’s GSS continued……some good buying here. Don’t ask me why, but some wines just slip under my radar. I can’t remember when I last had a Ferngrove wine from Frankland River in Western Australia, if in fact I ever have. In reviewing Denise’s GSS sale offers, I realise that it’s time I mended my ways. Denise has a swag of Ferngrove on special and what I’ve listed below are all consistently and solidly under my BBI for comparative value. 2007 / Majestic / Cabernet Sauvignon / S$40.84 – Oliver 93, Halliday 94. What’s stopping you? Drinking 2015-2019+. 2005 / The Stirlings / Shiraz Cabernet / S$48.12 – Halliday 94, Gourmet Traveller Wine 4.5 stars drinking now to 2020, RRP A$50. Yes, that’s right A$50. What a great selection. A bunch of 4-4.5 star wines for sub S$30 and nothing over S$50. Why pay S$21.50 for Little Penguin? On a BBI comparative basis, The Stirlings is the stand out value. I’m travelling at the moment but it would be remiss of me not to cast a quick eye over Crystal’s offerings. There’s just short of 100 Australian wines on offer and I can’t possibly list them all for good/bad value so I’m concentrating on those wines that (according to my data) rate 95 points or better and fall within my price tolerance as comparative value with their Australian retail price. So if you read between the lines, you’ll understand that not all wines meet that price threshold. 2008 / Clonakilla / Canberra / Shiraz Viognier S$83.30 – Epicure rates this wine at 5 star and RRP A$95 drinking 2015, Halliday rates it at 97 points RRP A$90 and drinking 2015-2025, and Gourmet Traveller Wine rates it 96 points also drinking 2015-2025, so no doubting its quality then. Its one of my favourites too, but I must admit that I’ve been buying it at around this price on a regular basis, so not sure about the “mega discount”. That having been said, it’s a good wine at the right price so if you want to try what is arguably Australia’s best shiraz viognier, give it a go. 2007 / De Bortoli / Estate Grown / Yarra Valley / Cabernet S$44.10 – Halliday rates this 5 stars and it sells RRP for A$35. 2004 / De Bortoli / Reserve / Yarra Valley / Chardonnay S$51.10 – Another Halliday 5 star wine (95 points) that sells for A$40. 2008 / Frankland Estate / Isolation Ridge / Frankland River / Riesling S$36 – Epicure liked it giving it 5 stars, drinking 2011-2019, Gourmet Traveller Wine liked it too giving it 92 points, suggested retail at A$28. If the wine you want is out of stock, just make sure you know when it’s going to be delivered. If there’s a wine on Crystal’s list that you’d like some data on, send me an e-mail at bastardbox35@gmail.com , and if I can help, I will. If you send it tonight, you should have an answer in time for the sale tomorrow. 2004 / Alkoomi / Frankland River / cabernet / S$50, member S$47.50 – Jeremy Oliver rates this wine at 87 points (4 star) drinking 2012-2016. My research shows it retails in Australia at around A$22 so at S$47.50, it’s beyond my comparative PPB (price pain barrier). 2003 / Alkoomi / Frankland River / shiraz viognier / S$50, member S$47.50 – Jeremy Oliver rates this at 91 points (4.5 star) drinking 2008-2011. Similar RRP in Australia so same PPB.